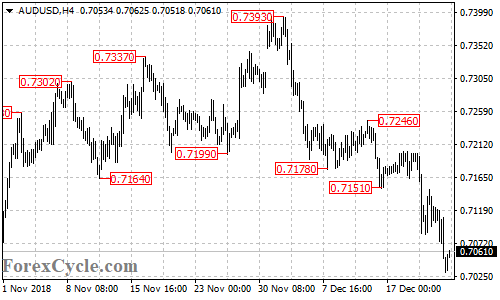 AUDUSD extended its downside movement from 0.7393 to as low as 0.7031. Resistance is now at 0.7100, as long as this level holds, the downside movement could be expected to continue and next target would be at 0.6950 area. On the upside, a break of 0.7100 resistance would indicate that the downside movement is complete, then next target would be at 0.7170 area.